Born in Lebanon in 1945, Seta Manoukian is a painter. Her early drawings reveal a sense of composition, a strong artistic hand and an original talent. She was teaching at Lebanese University when the Civil War began in 1975. After 10 years of war in Lebanon she had to flee, to LA defeated by war, where she still lives today, as a Buddhist nun. 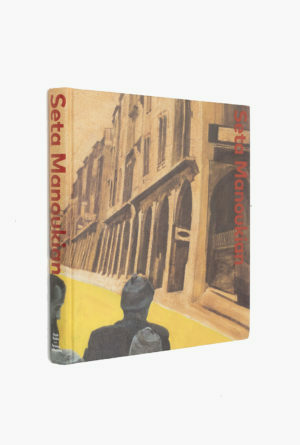 This publication looks back at Manoukian’s work, focusing on the 70s and 80s periods of her practice. It includes essays by Gregory Buchakjian, Kristine Khouri and Aline Manoukian. Co-published as part of the Saradar Collection x Kaph Books series. Kristine Khouri is an independent researcher and writer whose interests focus on the history of arts circulation and infrastructure in the Arab world, and archival practices and dissemination. Together with Rasha Salti, she has co-curated Past Disquiet: Narratives and Ghosts of the International Art Exhibition for Palestine, 1978 shown at the Museu d’Art Contemporani de Barcelona (2015), Haus der Kulturen der Welt, Berlin (2016), and at the Museo de la Solidaridad Salvador Allende, Santiago (2018). Khouri also curated The Founding Years (1969–1973): A selection of works from the Sultan Gallery Archives at the Sultan Gallery, Kuwait (2012). Kristine has contributed to numerous publications and was a section editor for the publication accompanying the exhibition Time is Out of Joint (Sharjah Art Foundation, 2016). She is a member of the Arab Image Foundation, Beirut. Aline Manoukian studied the history of photography in California. In 1983, she covered the Lebanese conflict, as a photojournalist for the Lebanese daily newspaper the Daily Star. In 1985, she joined Reuters news agency and later became head of the photo department, managing a group of staff and stringers, while covering the Lebanese conflict. In 1989, she moved to Paris, where she continued her career as a photographer and later as a picture editor. From 2010 to 2013, she was president of the French photo-editors' association ANI. In 2017, she became director of the newly established non-profit organisation Beirut Center of Photography, dedicated to promoting quality photography in Lebanon.